My Paper Pumpkin is on SALE! Use the promotion code PUMPKINDEAL to join Paper Pumpkin before August 31, 2013, and pay only $10 a month* for the first two months. You must click "Add Promo Code" and then enter the promo code PUMPKINDEAL in the "Promo Code" field when you sign up on the www.mypaperpumpkin.com website to take advantage of this promotion. When it asks you to select a demonstrator, please select Frances Wagner, Vero Beach, Fl (the link may do it automatically, if you get the option....please select me). So why don't you and a few of your friends get together and all order My Paper Pumpkin and meet and work on the projects together. 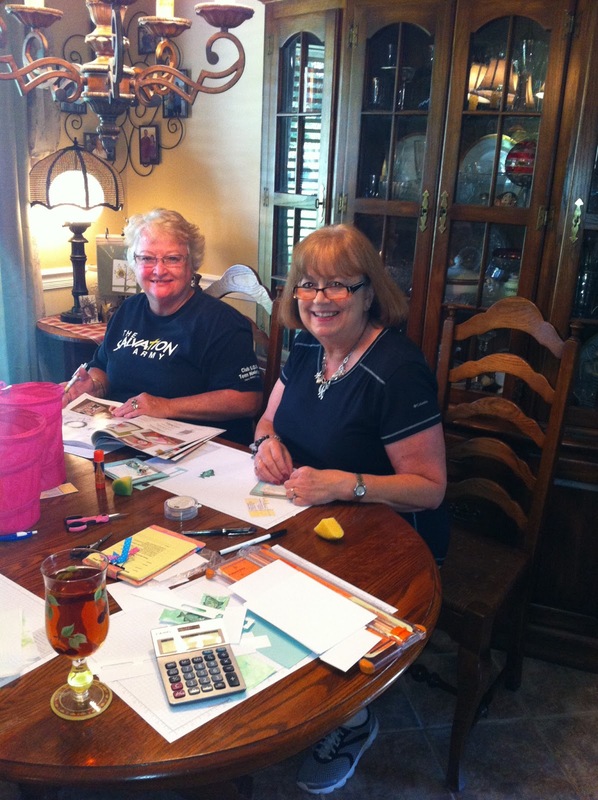 Have your own little stamp club and see how it works. What a fun girls morning out. Let me know if you have any questions. FYI just in case you don't know, when you purchase one of the Ronald McDonald house sets $3.00 goes to the Ronald McDonald house. 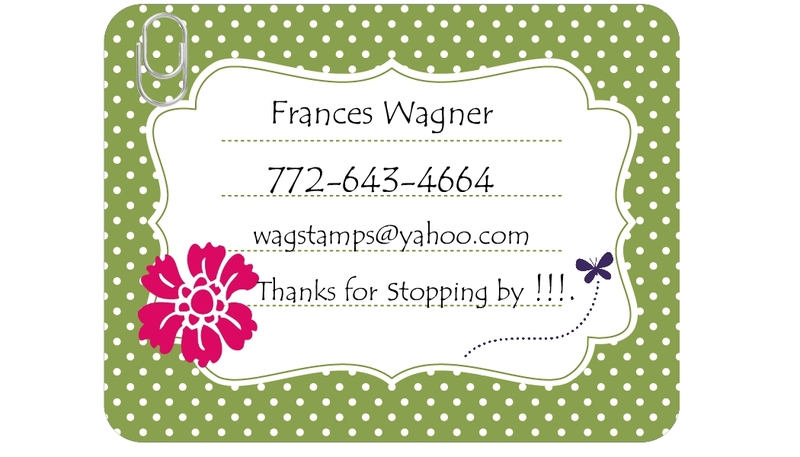 Just another way that Stampin' UP! helps the community. 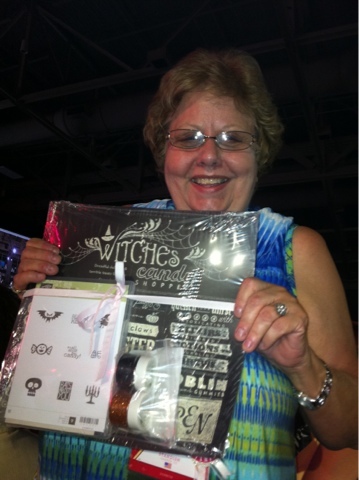 Thanks for stopping by and I hope you are inspired to try some new stamps in different ways too. IThis year at convention they gave us our cool convention bag after we were in general session (don't you love it)? In the bag we get all kinds of goodies. 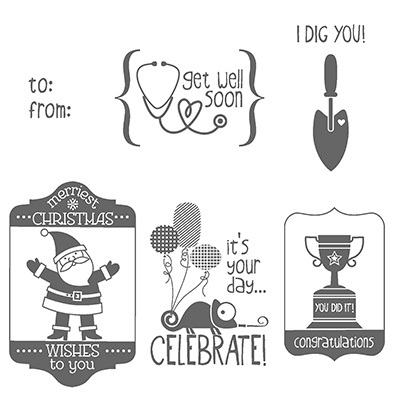 Stamp sets, make and take kits, wrist bands of different colors and all sorts of things. 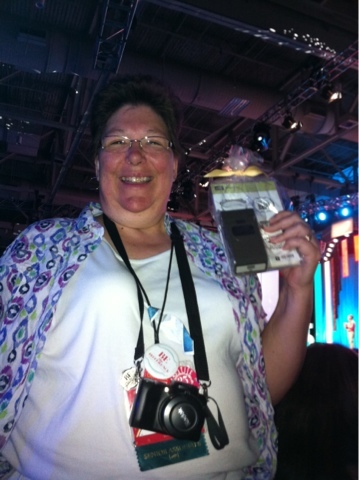 During the general sessions they call out a wrist band color and show us a prize that goes with it. Here are the prizes my group got. I got the new bow die from the Holiday catalog. You are going to love it. 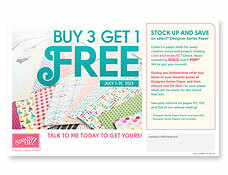 So easy to use I will be making some samples soon to show you. Debbie got a stamp set and matching punch. Karel got a Halloween set with new glitter and Halloween DSP paper! You can see how happy we were! 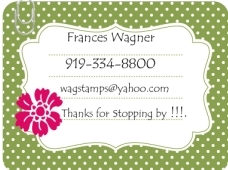 Do you ever wonder about how the cover of our Stampin' UP! 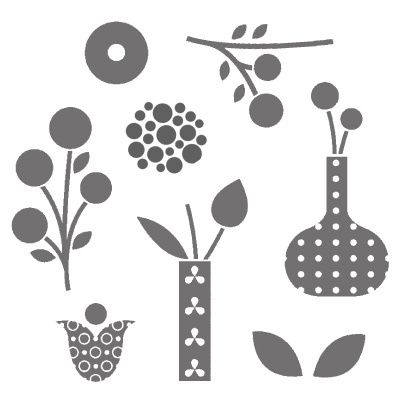 catalog comes to being? Well here are a few pics of behind the scenes of the photo shoot in the making. I thought you would enjoy it. Below the end product. 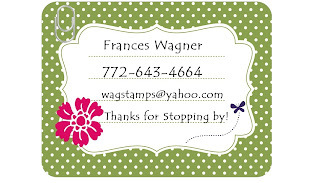 This is not a hired model but Tiffany B. one of Stampin' UP! product designers. This photo is of Tiffany and the photographer. 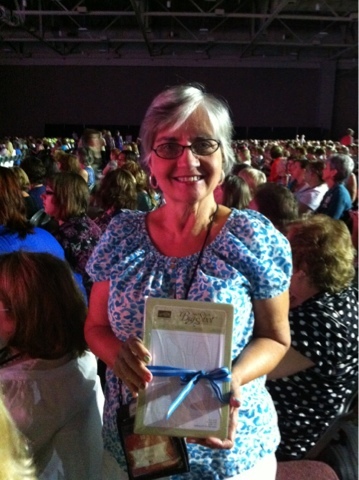 Carolyn holding a card she liked from my convention swaps. Xio and Kim (new friends from the crops that I have recently been too) Looking over the new catalog with smiles on their faces! 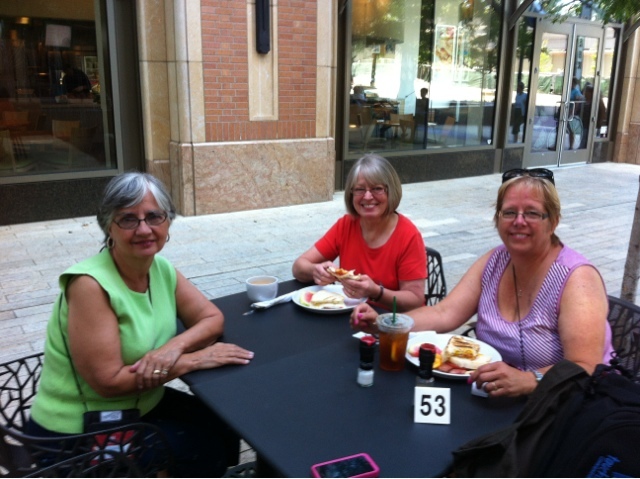 Cathy, Carolyn and Karman sampling the yummy lunch June prepared for us. I am showing them some new products from the new catalog and samples. 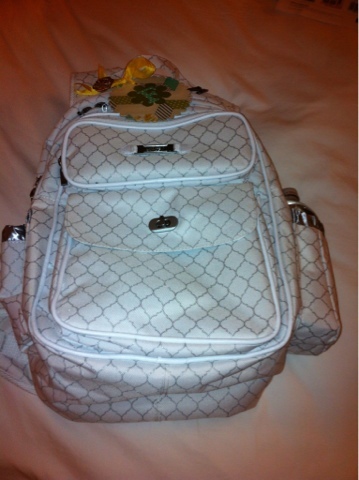 Below is one of the make and takes or in my case take and make we got from convention. The only difference is that I used a scallop punch since I could not find my circle punch. One day I will find all my stuff from the move. 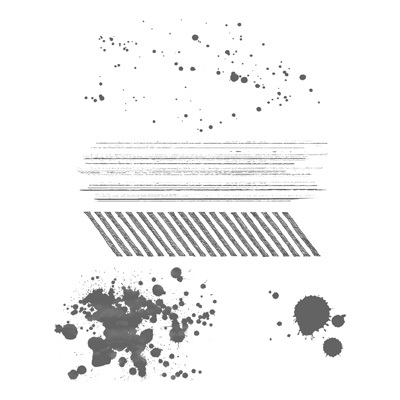 I think my new favorite (you know it changes from day to day however) but for now it is Gorgeous Grunge. 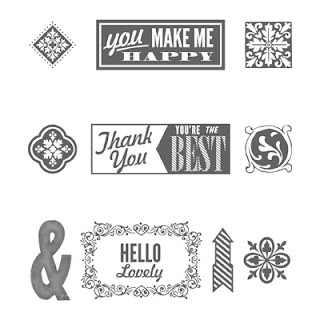 If you knew me or attended my classes a few years ago I know you bought itty bitty background stamp set because that was my go to favorite and this will be the same I love the splashes of color you can add to any card and make it pop. I also used the Hello Lovely set. I thought this was a cute card for our make and take. 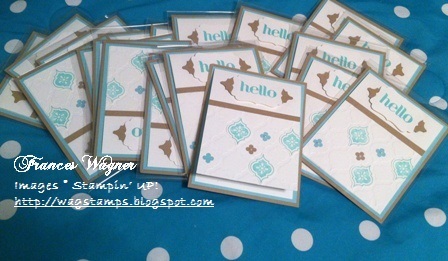 I loved using the washi tape on the envelope as well as the card. Thanks for stopping by. Have a great rest of the week. Day one started off with a tour of the Riverton Stampin' UP! Home office! What fun to see behind the scenes. What a beautiful campus. This is my team members from left to right Debbie Green, Karel Standish and me. We are waiting for the bus to take us to Riverton for the tour. Below is Karel standing in the Atrium in front of the water fall. It is so beautiful. If I liked cold weather I would love to work there but........... I am a warm weather girl. Debbie in the same spot! 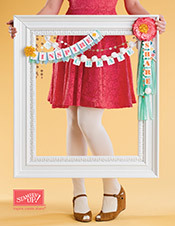 This is a cute banner across the second floor. Below is the warehouse where they pick your products before they go to UPS and Mr. Brown deliveries them to you. One of my favorite parts of the tour is the Legacy room where they have vignettes to showcase our products in home decor'. Here are a few ideas for you to try. Ok this should give you a little glimpse of the possibilities you can make (not just cards). 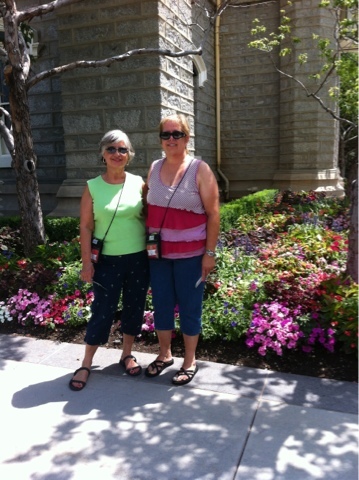 First day we were in Salt Lake City the convention had not actually started but we had things planned. After taking tours of the city and shopping some of the North Carolina Demos ( a Yahoo group) met for dinner at the Olive Garden for fellowship and of course a card swap and we shared ideas also. Some of us have been friends for over 10 years and we meet several times a year to stamp together and to share ideas with one another. 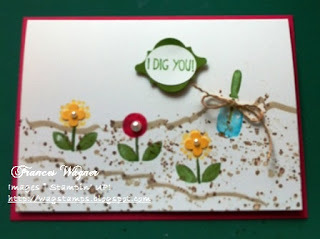 and this was a fun easy card to make. 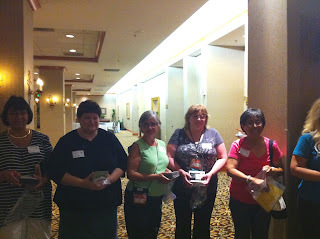 After dinner I was scheduled for yet another swap a WOW swap from Stampers Xpress sponsored by Kelly Gettlefinger. There was 2 groups of 20 to swap and it was fun to get new wow ideas. Below is Kelly our swap hostess. This was my first time to meet Kelly in person and it was so cool because when you see her post each week and we exchange emails you finally get to meet. Everyone was so nice. This is my card for the wow card swap and you can see the pieces as I was working on it. I arrived here yesterday after a crazy plane ride. After being diverted on my first leg of the trip from West Palm Beach to Detroit by way of Orlando. On the jet way to the terminal we were met by 2 green firetrucks. Ummm scary thought, they decided we could get off the plane and on my way out the door I heard the pilot say there was smoke in the cockpit! We had to reschedule our flight. Good thing for me I got a direct flight to Salt Lake City. I even got in 45 min earlier. NOTE: This is the first time I am trying blogging from my phone, so bear with me. I thought I would share some photos with you. 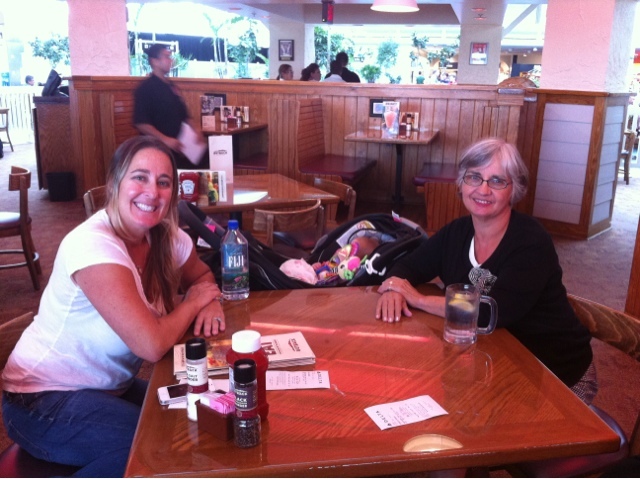 This is Beth, Brook and me at Outback at the Orlando airport. We were seat mates from West Palm Beach. Having breakfast with Carol and Carol they are demos from Maryland. We met at Leadership conference in Nashville in a snow storm a couple of years ago! 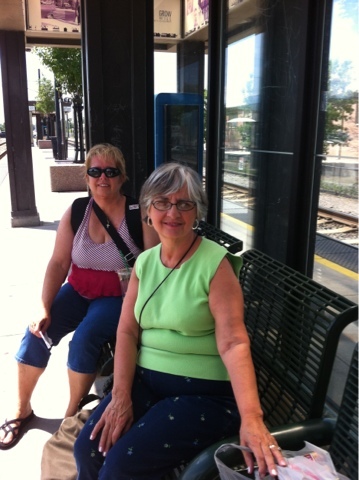 Carol and Carol and me waiting for the Trax to take us to Walmart to get supplies. 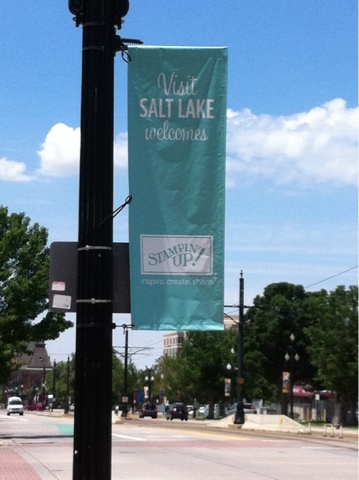 One of the banners around the convention center. My favorite color of course. 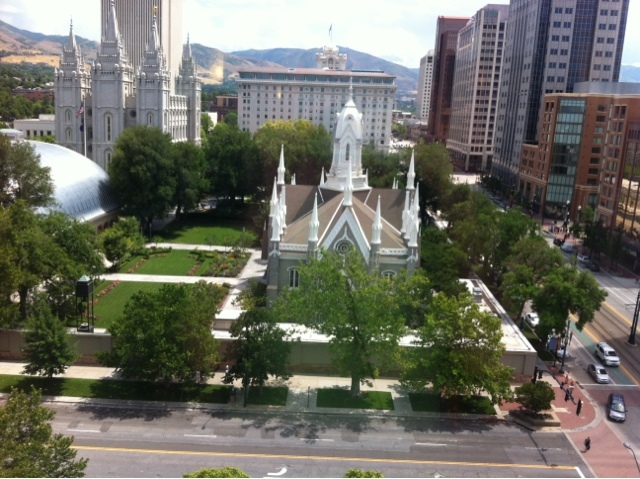 Ariel view of Temple Square.